To get to the starting point, you'll need to find route 76 where it crosses I-15 about 15 miles north of Escondido, CA and about 10 miles south of Temecula, CA. Exit I-15 on to Rt. 76 heading east. The route starts about 21 miles east of the Interstate. After you've headed east on 76 for about 15 miles you'll see a sign for Palomar Mtn Rd at this point you'll veer left. About 6 miles further up the road you'll veer left again at a sign that says S-6 (San Diego County Road 6) which is where the fun begins! This part of the route is INCREDIBLE. Take it up the mountain until you come to a 4 way stop sign. There you will see Mother's Kitchen bike bar/diner to the left. You can stop there or take a right and continue this time on E. Grade Road. This is a great road to and will take you all the way down to Lake Heneshaw. After passing Lake Heneshaw you'll come to a stop sign. If you take a right you'll be back on 76 and will end up passing where you veered off of 76 and would have made a complete loop. That section of the road is OK but if I were you, I would just turn around and double back on East Grade road and head back down S-6 ... then turn around and do it again and again and again. Don't take this route for the scenery ... you'll need to keep your eyes on the road! Take it for the challenge as it "is the most technical road in Southern California." The scenery is great though as you'll be climbing mountains and have great vistas of the surrounding areas and you'll be traveling through some lush forests. Overall it is much more than just a technical route as it offers some of the best scenery in Southern California! The route is perched up high in a secluded mountain peak in the Cleveland National Forest. In fact it passes right by the Palomar Mountain Observatory (space telescope). And, you know if the government selected a site in southern California for a high powered telescope that they chose an area that not only has exceptional elevation but also is far removed from civilization and resulting light pollution ... so you know this area has to be pristine ... and it is!. Rock solid 5 in the motorcycle road quality category. Multiple decreasing radius turns thrown in to back to back hairpin turns, add a few smooth snake turns and a few long sweepers and you have yourself a darn good ride. Mobile gas station @ the Interstate 15/State Road 76 interchange. Two different casinos after you start heading east on 76. Several snack/liquor stores. You have to stop at "Mother's Kitchen" at the top of Mt. Palomar. When I was there the parking lot was entirely filled with motorcycles and everyone was hanging out, trading stories, and having a great time. on April 8, 2011 11 out of 12 members found this review useful. Great Ride and like many have said very technical. I am from the area and anyone who rides makes their way to Palomar, almost as a "right of passage". Both novice and experienced alike take this road head on, but I'm writing this review to caution the novice. Two friends of mine both newer riders tried to prove themselves on this road and were killed. Just be safe and be careful on Palomar Mountain and don't under estimate it. on June 6, 2014 7 out of 12 members found this review useful. This is a windy road, particularly South Grade. People live on this road, it should be respected. You should obey traffic laws and do not cross ove the lines. Each year, at 26 to 30 riders are killed or greatly injured on this road. Please don't victimize the residents and visitors to this beautiful place to satisfy your need for adrenalin. on December 31, 2013 5 out of 5 members found this review useful. Great ride up the face of Palomar Mountain on the S6 side. Well engineered road, so once you get your turn line, you're good to go on each of these bends. The downhill side - S7 towards Lake Henshaw - is a little rougher in places. Looks like SD county is a little behind on maintenance, but still in all - a nice stretch of road. I did take a few breaks to check the scenery - several excellent Scenic Overlooks that are worth checking out. Recommended! on March 11, 2012 3 out of 3 members found this review useful. Just wanted to point out an alternate route for the dual sport guys. You can take the Nate Harrision Grade route up the Mountain. From there you have your choice to take the short or long way down... or just turn around and take the Nate Harrison Grade route back down. Keep an eye out for hikers. on January 10, 2011 3 out of 3 members found this review useful. This is an absolutely beautiful area, not far from where I was born (in Orange County). One quick note on Mother's Kitchen -- it's not open Monday-Wednesday, but you definitely want to stop there while you're out there, so plan your trip for Thursday-Sunday! on September 11, 2010 3 out of 3 members found this review useful. Did this ride today as my first ride in the state of california. I'm a new resident and thoroughly enjoyed this route. on May 18, 2010 3 out of 4 members found this review useful. Riding it the second time was as exciting as the first. Like being in love all over again. If you ride for white knuckled twisties that have you flicking your bike back and forth, you'll never leave. Top off before you pass the casino. on March 7, 2010 3 out of 3 members found this review useful. Outstanding road! My brother and I did this route the middle of last summer and were blown away. The scenery was awesome but we didn't see much of it because we were so focused on the road and staying on it. It was a beautiful day and there were alot of other riders out enjoying road. The only downside is that when you are on a cruiser with floorboards, you can't lean into the corners like those on crotch rockets and duel sports. HIGHLEY RECOMENDED!! on January 14, 2010 3 out of 5 members found this review useful. NEW INFO!!! They have gouged grooves in the center line all the way down the west grade. Don't go in too hot on the decreasing radius turns... ;) Anyhow, this is a great road. on June 2, 2008 3 out of 4 members found this review useful. on September 19, 2015 2 out of 2 members found this review useful. I rode Palomar when I was about 16, I was with my dad. He was on a 52 Panhead and I on an 76 sportster. I remember it as being a little challenging but I was a wild kid, not easily phased. I didn't drop the bike and remember having a great time. This would have been about 30 years ago. on June 27, 2009 2 out of 2 members found this review useful. Best twisty road in Southern California!!! Went out there in May 09 and was among a group of 20 sport bike riders that were all Palomar Mtn virgins. Half of us have been back there twice since then and will be adding this to our list of annual must rides. on September 7, 2008 2 out of 3 members found this review useful. I have seen an heard comparisons to Deal's Gap, and though this is a fun road, I have to give the nod to the Gap. The pavement is not as well maintained here and the curves not as tight. that said my biggest problem with the Palomar Road is the traffic. I would only bother on weekdays. On weekends there are too many cars and trucks going way too slow. Still a worthwile ride if you are in the area. on February 16, 2008 2 out of 3 members found this review useful. I live in Southern California and saw this listing on MotorcycleRoads.com and decided to check it out. I was absolutely blown away by this road! --went up and down the west side of the mountain about 4 times, then hung out at Mother's Kitchen for a while, hooked up with some other riders and headed down the east side to the lake -- incredible ... can't believe I lived only a few hours away from this area/road and never tried it. I'll be doing this one a couple times a year!! on January 5, 2017 1 out of 1 members found this review useful. This road is extremely technical. First time i have ever scraped pegs and i have about 1-2 mm of chicken strips left. Be careful and take it slow at first. on February 8, 2015 1 out of 1 members found this review useful. This is a fabulous ride. My suggestion is to avoid being on the road early in the morning when the sun is rising. Visibility is horrible when sun is in your eyes. I made this mistake and ended up taking a break for an hour at a roadside taco shop to wait for the sun to not be glaring in my face. Other than this, I thought the Lake Henshaw portion of the ride was the most beautiful and fun. I can't wait to get back and do this ride again with friends. Amazing. on December 28, 2013 1 out of 3 members found this review useful. A very technical road. I would not recommend this ride for anyone that isn't comfortable on their bike enough to get really low. We went through on two Street Glides and we were scraping floorboards on most of the turns. Plenty of other bikes out there and some good food at the small diners around there. I would for sure do that ride again. on April 14, 2013 1 out of 1 members found this review useful. One of the most fun roads I have had a chance to ride. We went during an off season and we only saw a few other bikes. on February 10, 2011 1 out of 2 members found this review useful. on January 21, 2010 1 out of 2 members found this review useful. Took the ride on New Years Day and had the road to myself. Drive was super and I took it all the way to the Mt. Palomar observatory. They have a great tour and museum there - don't miss it. Great chili at Mother's Kitchen! on September 18, 2008 1 out of 2 members found this review useful. on July 24, 2008 1 out of 2 members found this review useful. I am here visiting from Tucson, AZ. I rode Palomar Mt. today and it was awesome!! I came out here just to ride that road. I was lovin it !! on April 21, 2008 1 out of 2 members found this review useful. on October 28, 2017 0 out of 0 members found this review useful. I am a newish driver (1 year) and this route was just the best I've experienced so far! Great turns, views and long stretches. I would recommend this route to anyone who wants to enjoy themselves. There is a cool bar & Grill by the lake at the midpoint of the route. on August 18, 2017 0 out of 0 members found this review useful. Absolute blast to ride this loop. As stated, many opportunities to lean your bike over and throttle out of a turn as well as straights to go real fast. Midweek is best to avoid traffic and farm trucks. This is probably my favourite route to ride in the area. The hwy in an out has one stop sign (I think) and is a long smooth road with lots of gentle turns. The run up and down Palomar mountain is one you will remember... lots of 180 degree switchbacks and a few really cool places to stop at the top and look over the valley. The far end of it has a nice overview of the lake which is nice. Also, you can reverse the ride up and down the mountain for added challenge. I could easily do this ride once a week and not get bored of it. on May 27, 2010 0 out of 2 members found this review useful. 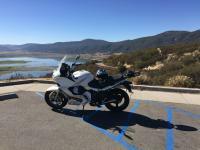 really a great ride, i will do this agin .The scenery is so great you have a hard time keeping your eyes on the road ., so watch it . on September 24, 2009 0 out of 1 members found this review useful.